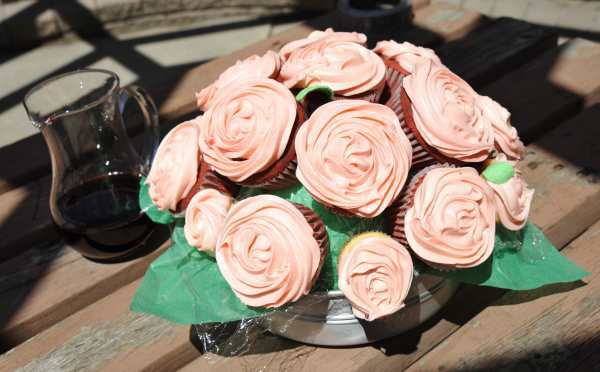 For Mother’s Day, I made two cupcake bouquets, one for each of the moms in my life. And just in time for Father’s Day, I thought I’d post one of the beautiful photos my dad took of one of the bouquets. They’re a little time-consuming to make, but not nearly as tough as I thought it would be. Plus, the effect is pretty cool, everyone thought I was bringing over flowers, at least from a distance. I read/watched a bunch of online tutorials and stories to help get me started. You can find some here, here and here. You’ll need a base, preferably one with a little weight to it, and a styrofoam ball. I cut one in half to use it for both arrangements. I simply covered the foam with tissue paper and some plastic wrap to keep it from getting greasy, but you could also buy green styrofoam. Once the foam is in the container, I started with the cupcake on top, and then made circles around it. Use whatever cupcakes you like (I made vanilla and red velvet, all with vanilla buttercream frosting), but it was really handy to have both regular and mini cupcakes to fill in the gaps. I used two toothpicks per cupcake to hold them in place. Against the advice of all the guides I read, I waited until after the cupcakes were on the arrangement before I frosted anything. I have no idea how I would have placed already frosted cupcakes on there without making a mess. The finishing touch was a couple of sugar leaves I had left over from another project and voila! Next time I’ll add more leaves and try to put the cupcakes closer together, but for my first attempt I was a happy camper. A great and unique idea. This is a beautiful bouquet. Both Moms must have been very happy.